The subject of this majestically shining Fedoskino paper mache box is based on a poetic folk fairy-tale "Snowmaiden" or "Snegurochka", later rewritten into the world-famous Alexandr Ostrovsky’s play with incidental music by Tchaikovsky. On this Kholui paper mache box the highly-talented Russian artist - Kosterina has chosen to depict Snegurochka’s walks in the winter woods. Beautiful Snegurochka isn't a human being; she is the daughter of nature. Her parents are Beauty Spring and Father Frost. The composition of Fedoskino paper mache box is painted mostly in cold blue tons suitable for the reproduction of a winter scene. On the background shining stars gem the dark sky, they are painted in vibrant soft colors to make a mystique effect on a viewer. Gold paint details the characters' costume. Snowmaiden is painted so skillfully that it's easy to recognize winter spirit in her: her skin is snow-white, her hair is fair and her dress is decorated with affected frost printing. The detailing of her costume strikes with its intricacy and neatness, and gold paint adds a touch of gorgeousness to it. The Kholui paper mache box’s composition is framed with beautiful patterns painted in gold, the same affected patterns painted in gold wrap around the sides of the lacquer box. Traditionally to Kholui miniatures, this lacquer box “Snowmaiden” is made out of high-quality paper-mache. Black lacquer covers the exterior and red lacquer covers the interior of the Kholui paper mache box. The Kholui paper mache box is hinged from the top and rests on a flat platform. On the lid the artist identifies the Kholui paper mache box as an author's original design: Kosterinа signs the Kholui paper mache box with her name, the village of Kholui, and the title "Snegurochka". This lacquer box of original design will be a perfect Christmas’ gift for anyone fond of original and high-quality presents. 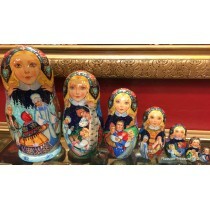 The Feskoskino paper mache box “Snegurochka” will also nicely fit any Russian art collection and surely take a place of honor in it.